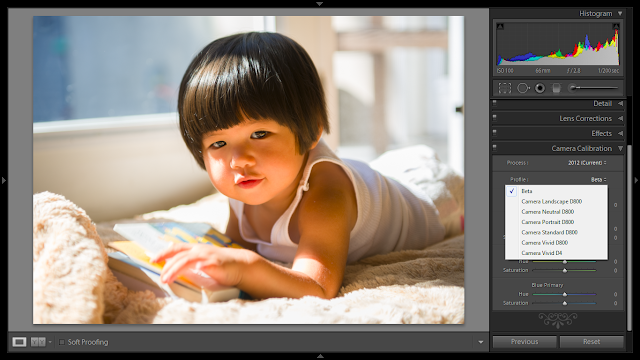 When Lightroom 4.2 was released, it included raw support for the Nikon D600 (hands-on review here), albeit in beta. One of the issues is that there was only one camera profile, unlike other Nikon cameras, where you could change the camera profile to Standard, Neutral, Vivid, etc. to mimic the picture styles of Nikon cameras. I found out that you can apply the camera profile for one camera to another. In this case, I used the camera profile for the Nikon D800 to create a profile for the Nikon D600. The concept can be applied to take the camera profile of any camera (not limited to the same maker) and apply it to another for some interesting effects. 1. Download DCPTool by SandyMcGuffog. 2. Copy an existing camera profile. 3. Use DCPTool to decompile the camera profile from a binary file to an XML file. 4. Edit the XML file and replace the tag into your target camera and save as a new camera profile in xml format. 5. Use DCPTool the new camera profile into binary. 6. Add the camera profile to Lightroom. STEP 0: Make sure Lightroom is not running. The camera profiles are binary files. To edit them you need to decompile them into xml using DCPTool by SandyMcGuffog. Download the zip file from Sandy's site (beware fake sites that purport to allow you to download DCPTool but are actually full of links for downloading spyware). Extract the file and make a note of where you extract it. For PC it's in "C:\ProgramData\Adobe\CameraRaw\CameraProfiles". Note: ProgramData is a hidden folder. You'll need to make sure that in Folder Options, the option Show hidden files, folders, and drives is selected. It will then show up as a grayed out folder. For Mac I believe it's in "Macintosh HD/Library/Application Support/Adobe/CameraRaw/CameraProfiles/"
The camera profiles are binary files. To edit them you need to decompile them into xml using DCPTool by SandyMcGuffog. Just extract the file. You'll see a folder called Binaries and in it there are folders for OS X and Windows. For simplicity, copy the camera profile into the Windows or OS X folder as applicable. You should also rename the file so that there are no spaces. For example rename "Nikon D800 Camera Vivid.dcp" to "NikonD800CameraVivid.dcp"
To run DCPTool you need to use a command line. In Windows, hold down shift and then right click on the Windows folder. Select the option "Open command window here". In Mac I believe you can use Terminal.app to get a command line. For xxxxxx.dcp use the filename of the original camera profile. For yyyyyy.xml use any filename (but to be organized you can use the same name). You don't need to exit the command prompt. We'll come back to it later. Edit the new XML file using any text editor. In Windows I use notepad. Toward the end of the file is a tag called and the name of the camera that the profile is for. Change this into your camera's model. If you wish you can also change the name of the profile as it will show up on Lightroom. There is a tag at the beginning of the file called . That's where you place the new name. Save the edited XML file as a new XML file, preferably in the same directory as dcptool. When you do so, under File Type select All Files instead of Text Files, then add .xml to the filename. If you save it as a text file DCPTool won't recognize it. xxxxx.xml should be the name of the new xml file. yyyyy.dcp should be the name of the new camera profile. Go to the folder where Camera Profiles are stored. Create a new folder for your camera model, e.g. Nikon D600. Copy the new camera profile into that folder. When you run Lightroom, you can now select the new camera profile for photos from your camera model. Remember - this only works for raw files (not necessarily DNG) not TIFF or other files. If you find interesting cross-camera profiles please feel free to post them in the comments. BTW if this is all too tedious for you, you can buy a whole bunch of cross-camera profiles for your camera from PSKiss.